VJ Dhivyadharshini, popularly known as DD, made her acting debut in Kollywood with Dhanush's Pa. Paandi, in which, she featured in a brief cameo role. After that, she was signed by Gautham Vasudev Menon for Dhruva Natchathiram starring Chiyaan Vikram in the lead role for an important role. 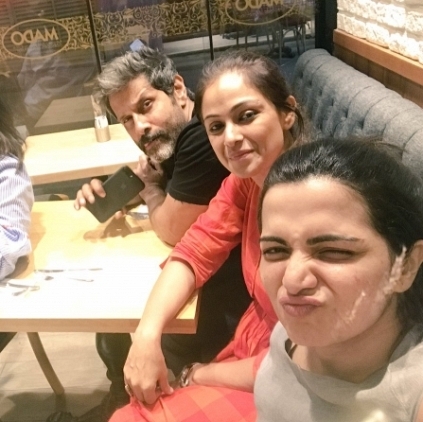 DD took to Twitter to share her experience working in Dhruva Natchathiram. She tweeted, "Nijamave did I share(silver)screen space wit dem. surreal, ThnkU KennySir @realradikaa Mam @SimranbaggaOffc Mam n @menongautham sir. ThnkGod"
WHO SURPRISED DHANUSH AND MADE HIM HAPPY? National Award winner Dhanush is involved in his maiden directorial Power Paandi where Rajkiran plays an important role. The film is fast nearing completion and the multitalented Dhanush took to his official Twitter handle to appreciate the popular VJ Dhivyadharshini’s performance in the film. He tweeted, “Filmed @DhivyaDharshini cameo in #powerpaandi. She performed with so much ease and confidence. Very happy and surprised. Superb DD”. It has to be noted that DD was also seen as Madhavan’s sister in Nala Damayanthi years ago. It sure is a nice feeling to be lauded by a National Award winner. Way to go DD! People looking for online information on Dhivyadharshini, Dhruva Natchathiram, Vikram will find this news story useful.